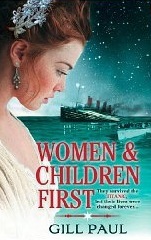 As the weekend marks 100 years since the Titanic sank, I am reading Women and Children First by Gill Paul, which is available on Kindle for 99p. The Titanic was the most magnificent ship ever built, offering every possible luxury to her passengers – yet on the night on the 14th of April, 1912, she sank in the North Atlantic, leaving the lucky ones floating in wooden rowing boats, and the rest struggling for their lives in the icy water. This novel follows the fortunes of Reg, a handsome young steward who works in the first-class dining room; Annie, a gifted Irishwoman who is travelling to America with her four children; Juliette, a titled English lady who is pregnant and unmarried; an American millionaire and his wife who are trapped in a poisoned marriage; and a mystery passenger who never shows her face in public. The sinking of the Titanic not only steals lives but blows apart the futures of those who survive. Coming to terms with the shocking events, survivors form new attachments, make decisions with tragic consequences, and watch all their old certainties crumble. How can life ever be the same again when you have heard 1,500 people dying in the water around you? I have just finished, Hidden Agenda by Carol Smith. I might look for the book you have posted about for the weekend. Sad event that has given so many something to write about. Oh, this sounds like a good read! Thanks for the tip. ALthough the sinking of the Titanic was tragic, it intrigues me so I'm really enjoying the book. The author has obviously done a lot of research about the ship and the customs aboard. This sounds like an amazing book. I'm really looking forward to reading this one. Hi Gina. I hope you enjoy it as much as I am. Last week I read The Captain's Daughter and loved it. It began with the sinking of the Titanic and how the lives of two of the survivors were marred by the tragedy. Lovely book. I like the sound of Women & Children First too. Hi Debs. I saw your review of The Captain's Daughter on Novelicious last week and it sounds good too.